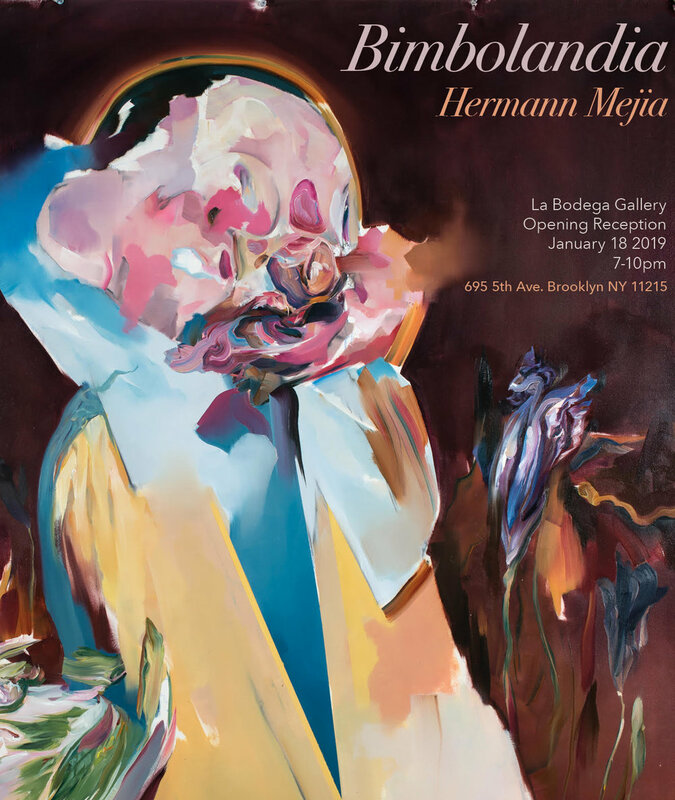 La Bodega Gallery is thrilled to be presenting "Bimbolandia", a solo exhibition by Brooklyn based artist Hermann Mejia. This exhibition will feature new and exciting paintings, sculptures and video work. "Bimbolandia was a Caracas theme park created at the end of the 70s, in a rich Venezuela, determined to emulate its northern neighbor and Europe. Bimbolandia was a bootleg Disney; a Latin American interpretation of American entertainment; colorful and grotesque with vomit fragrance of dizzy children, alcohol, ﬂowers, ﬁne perfumes and cotton candy; a hidden sketch of the ﬁrst world, which was once a symbol of modernity and development and over the years succumbed to abandonment and chaos. I remember with nostalgia the frequent visits to the park that I made as a child with my family and the interactions with their fantastic characters, always elegant and willing to give you a hug and charge you for the picture. One afternoon, when I got off the caterpillar roller coaster with my brother, one of the disguised characters approached us and took us by the shoulders and said: are you lost?, do not worry, trust me ... And stretching his index ﬁnger showed us to the way As an adult, lost in Caracas, I went to Bimbolandia and I was shocked to see how small it was and how much the person who once showed us the way had gained weight." -Hermann Mejía (1973) is an American visual artist with Latin American roots, having been born in Caracas. He lives and works in Brooklyn, New York, where he has had his studio for the last couple of decades. He was recently featured by the Huffington Post, in a piece published to coincide with the date of Simon Bolivar’s birthday, as one of 15 famous Venezuelan artists its readers “should know about”. He subsequently received formal training and a graphic design and illustration degree at the prestigious Instituto de Diseño de Caracas (Caracas Design Institute, 1991-1995) Starting in 1995, he began exploring fine arts as a vehicle for more personal artistic expression, which resulted in artworks that have been shown in many art exhibitions, both collective ones and solo shows, initially in Venezuela and later in several other countries. At the same time, he has worked as an on-demand illustrator for written media and for many publishers.